A convoy of U.S. forces armored vehicles drives near the village of Yalanli, on the western outskirts of the northern Syrian city of Manbij, March 5, 2017. The U.S. top general, Joseph Dunford, along with the chief of Russia's general staff, Valery Gerasimov, were hosted by their Turkish counterpart, Hulusi Akar, in the Mediterranean resort of Antalya. According to officials, the meeting sought to find ways to avoid potential confrontations among the forces operating in Syria. "First the de-conflicting issue between Russian and U.S. forces, which are only 10 kilometers apart from each other," suggested former senior Turkish diplomat Aydin Selcen, "and then the other de-conflicting for the U.S. is their two allies on the ground, the YPG and Turkish armed forces, not to get in touch with each other." Ankara says the Syrian Kurdish militia, the YPG, is affiliated with the PKK, which is fighting the Turkish state and is internationally designated as a terrorist organization. Washington and Moscow see the YPG as key to defeating Islamic State, and ousting IS from its self-declared capital of Raqqa. 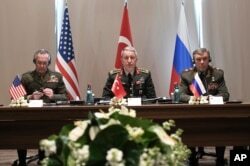 Turkey's Chief of Staff Gen. Hulusi Akar, center, U.S. Chairman of the Joint Chiefs of Staff Gen. Joseph Dunford, left, and Russia's Chief of Staff Gen. Valery Gerasimov attend a meeting in the Mediterranean coastal city of Antalya, Turkey, March 7, 2017. Those differences have come to a head in the Syrian town of Manbij, which the YPG liberated last year from the jihadists. 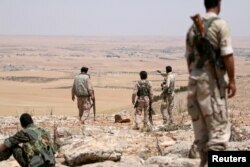 Turkish forces, along with elements of the Free Syrian Army, are marching on Manbij, and already a number of deadly clashes have occurred between the two sides. To defuse tensions, U.S. forces deployed between the rival groups. A "visible sign of deterrence and reassurance," U.S. Capt. Jeff Davis, a Pentagon spokesman, described the deployment Monday, adding, "There is not a need for others to advance on it [Manbij] in attempts to 'liberate' it." While Moscow brokered a deal with the YPG to allow Syrian regime forces to create a buffer zone, that deal may have opened a door to a key YPG objective. "In return for turning over outlying areas of Manbij to [Syrian President Bashar al-] Assad, Assad promised free access to Afrin canton to the west, so essentially the Kurdish cantons have been linked," said political consultant Atilla Yesilada of Global Source Partners. FILE - A Kurdish fighter from the People's Protection Units (YPG) carries his weapon as he walks at the faculty of economics where a defaced picture of Syrian President Bashar al-Assad is seen in the background, in the Ghwairan neighborhood of Hasaka, Syria, Aug. 22, 2016. Such a deal, if confirmed, would be a blow to Ankara. "Turkey will prevent the unity of the PYD [Syrian Kurdish] cantons at all costs. We will continue our struggle," warned Turkish Defense Minister Fikri Isik on Sunday. The YPG in its war against IS has up until now linked all the Syrian Kurdish cantons except Afrin. "Until now the Syrian Kurds have played their hand very carefully using both big powers [Washington and Moscow], to their interests. They have shown some deft diplomacy indeed," pointed out former Turkish diplomat Selcen. Such diplomacy is increasingly isolating Ankara. "Turkey has been completely abandoned in Syria. Russia does not want us to expand our territory," noted consultant Yesilada. "Our viewpoint [that] the YPG is a terrorist organization has been flatly rejected by everyone involved in the area. The United States does not want us either in Manbij or Raqqa." Ankara is lobbying Washington to abandon the Syrian Kurds in favor of its forces in Syria in the war against Islamic State; however, analysts say it's widely expected the U.S. will side with the YPG and increase its support of the group as the YPG continues to make advances on Raqqa. Consultant Yesilada says Ankara has few options. FILE - Fighters of the Manbij military council, take an overwatch position in the southern rural area of Manbij, Syria June 1, 2016. 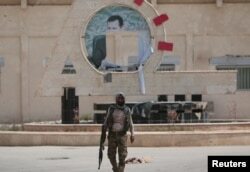 "Either we could limit ourselves to the triangle we've liberated and try to settle some Syrians there," Yesilada said, "or attack the Kurdish cantons directly from our border, and that would create a firestorm in the world community and it would mean war with the Syrian Kurds which may spread to Kurds in Turkey." The YPG has warned any such attack would compromise its fight against Islamic State. Syria is expected to top the agenda when Turkish President Recep Tayyip Erdogan visits Russia on Thursday. Domestic politics, however, could be the defining factor in Ankara's next move. With Erdogan courting nationalists' votes ahead of a referendum next month to extend his powers, analysts warn he is expected to continue to take a hard line against the Syrian Kurdish militia in what he calls his war on terrorism, whatever the international consequences. "I expect more pressure on the PKK and by default the YPG," predicted Selcen. "With the referendum in sight and the serious possibility of a 'no' vote winning, definitely internal politics will effect foreign policy, and that includes the military operation in Syria."